The 2014 FIFA World Cup Tournament has entered the sudden-death rounds, making the historic use of the penalty kick a continued element in deciding the outcome of this year’s World Cup soccer tournament. So far, two teams have advanced through the shootout penalty kick rule -Brazil and Costa Rica – continuing the controversy and frustration surrounding the penalty kick rule. The penalty kick in soccer is arguably the most frustrating part of the game for spectators. It is a do-or-die scenario where the odds greatly favor the offensive efforts over the defensive. That is, the goalkeeper has very little chance to stop the bullet-like penalty kick being fired at him from just 12 yards away. “The winning goalkeeper will earn friends, but the losing one can pack his bags,” “It is an abomination and compellingly ludicrous”, said New York Times reporter, Rob Hughes. According to Hughes, the shootout penalty kick moment in any game is fascinating. After all, the coach has the ultimate decision on deciding who will take the kicks, looking into each players eyes to determine whose tank is empty, whose spirits are broken, and whose eyes have the look of victory in them. Still, Hughes explained that the most exciting and competitive matches can – and do – end in a fluke of luck or attack of fatigue. The better solution to end a tie game, according to Hughes, is to follow the path of the now defunct North American Soccer League. In those days during the 1970’s, the rules dictated that a single player would attack the goalkeeper from 35 yards out. The player had 5 seconds to score while the goalkeeper used the same amount of time to narrow in on his offender. “That ideas was brighter,” said Hughes. Still, the FIFA World Cup has considered the penalty kick, also called Law 14, a part of soccer’s history, and acknowledgement of the sport’s origin. In fact an Irish businessman created the first penalty kick in 1890. According to The US Referee Connection (USRC), Mr. William McCrum from the far north of Ireland first announced the rule as a penalty for a foul in front of the goal. Before this, the rule was a simple goal kick, taken by the goalkeeper from two yards in front of the goalmouth. The penalty kick was quickly attacked by the Victorian bearers of the time because soccer was a game played by gentlemen who simply do not cheat. Many people at the time, according to the USRC, considered the new rule as an oak spike in the heart of the game. “Some people called it a ‘death sentence’ for the game,” said Hughes. Eventually, the Irish Football Association presented the idea to the FIFA governing board in 1879. After much deliberation and debate, the international soccer body that governs the sport at every level in the world, adopted the law into the articles and bylaws12 years later. However, according to US News and World Report’s writer, Pat Garofalo, the use of the penalty kick as a means to decide a virtual tie, wasn’t actually used in the FIFA World Cup until 1978. FIFA authorized the use of the shootout penalty kick session as a means to end a stubborn match. “However, the first shootout didn’t occur until the following World Cup Tournament in 1982,” said Garofalo. So far, 23 shootout penalty kicks have taken place in World Cup history, including this year’s matches. The first FIFA World Cup Trophy that was won through shootout penalty kicks came during a historic final’s match between Brazil and Italy. 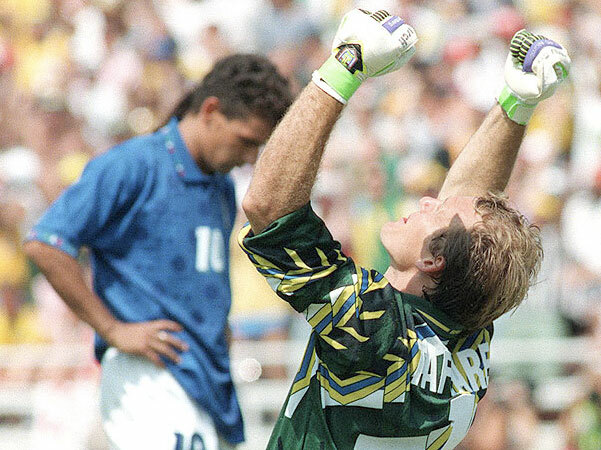 The game was won after Italian star, Roberto Baggio missed the goal wide, giving the trophy to Brazil. According to Garofolo, all spectators should be familiar with the rules of Law 14. The law is engaged after 90 minutes of regulation time, plus an addition two 15-minute overtime periods have expired without the outcome of the game decided. At this point, five players are chosen from each side. The head coach chooses the player’s who will take the kick. The ball is lined up 12 yards from the goalkeeper, and each team gets five attempts to make a goal. Different players take the shots and the opportunity to shoot is alternated between both teams. The team that makes the most shots is the winner. If the teams happen to be tied after the initial five shots, they continue the pattern in sudden-death fashion until one team ultimately makes the shot. While the shootout penalty kick rule involves completely fatigued players and a shell-shocked goalie, it is the law of the land when it comes to soccer. In fact, with no viable alternative solutions on the horizon, the FIFA World Cup penalty kick law will be ingrained the history of soccer for the far future. 10 Responses to "FIFA World Cup Penalty Kicks Continue as Part of Soccer’s History"
I’ve been exploring for a little for any high quality articles or weblog posts on this sort of house . Exploring in Yahoo I ultimately stumbled upon this website. Studying this info So i’m happy to express that I have a very just right uncanny feeling I found out just what I needed. I most undoubtedly will make sure to do not forget this website and provides it a look regularly. My option offered is use corner kicks with the full teams instead of the penalty kick. Why not? As an American who feels it’s like having a home run hitting contest deciding a game of this magnitude (sorry for the baseball reference! ), I’d prefer a variant of the NASL but put the ball 40 yards out but have one more offensive than defensive player and give them 1 minute to score. Like five offensive and four defensive or something like that. As it is now, it’s just who guesses better and I think the game deserves better. Milo, 120 minutes of straight out running? I played soccer for more than 40 years, and I know that after playing that long, you simply have no legs. It’s why boxing has only 15 rounds maximum for a heavyweight championship. The body just can’t perform any longer. I’m not saying the Shootout is the solution, but I am saying FIFA won’t budge. Ever. No viable alternative? Why not just play the game normally, with the first team to score a goal being the winner?